Choose from two different sizes when you sew my Goose in the Pond quilt block pattern. I've included cutting instructions for a quilt block that finishes at 22-1/2" square and a smaller version that finishes at 11-1/4" square. Change the fabrics to suit your needs, and if you're unsure about selections, take a peek at my article, How to Choose Fabrics for Quilts. The block is sewn from squares, half-square triangle units, and two different strip-pieced units. Goose in the Pond goes together easily with quick piecing techniques. Sub cut the shorter 2" strips from 2" wide selvage to selvage strips. Sub cut the shorter 1-1/4" strips from 1-1/4" wide selvage to selvage strips. Browse my big quilt block patterns index if you love large quilt blocks. 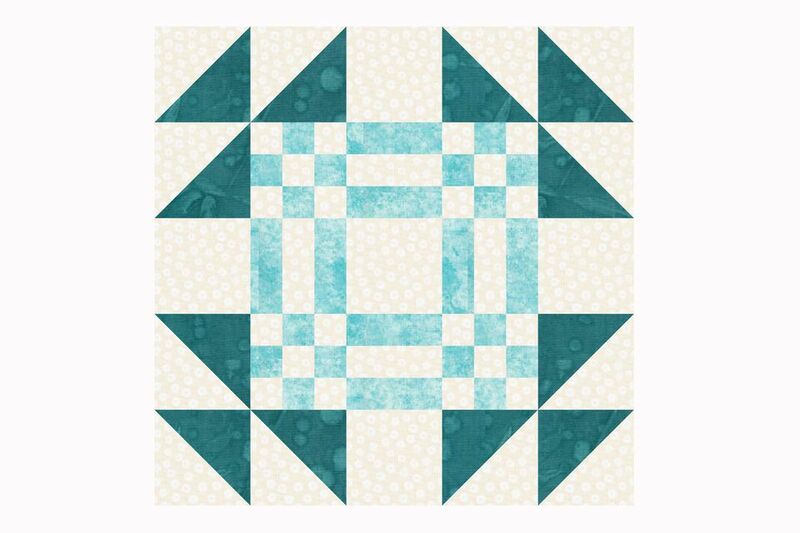 Use my quick pieced half square triangle instructions to combine a 5-3/8" dark square with a background square of the same size. Use 3-1/8" squares if you are making the smaller block. After assembly, you'll have two half-square triangle units. Each unit for the large block should measure 5" square. Repeat to assemble a total of 12 identical half-square triangle units. Use a quarter inch seam allowance throughout the remaining steps. Sew a 2" x 9" center patchwork strip lengthwise to each side of a background strip of the same size. 1-1/4" x 6" strips for smaller block Press to set the seam. Press seam allowances towards the darker strips. Square up one end of the unit and cut (4) 2" segments from it. Cut 1-1/4" segments for the smaller block. Sew a 2" x 17" background strip lengthwise to each side of a center patchwork strip of the same size. Press seam allowances towards the darker strip. Use 1-1/4" x 11" strips for the smaller block. Square up one end of the unit and cut (8) 2" segments from it. Cut 1-1/4" segments for the smaller block. Combine (1) step 2 segment with (2) step 4 segments to create a nine-patch unit as shown. Press. Repeat to create a total of four identical units. Sew a 2" x 21" center patchwork strip lengthwise to each side of a background strip of the same size. 1-1/4" x 12" strips for smaller block. Square up one end and cut (4) 5" segments from. Cut 2-3/4" segments for the smaller block. Arrange components as shown, lower left of the illustration. Sew into rows. Connect rows, taking care to match seams. Use straight pins to secure the patchwork. Sew remaining units into two vertical rows as shown. Sew rows to the sides of your step 1 unit. the large quilt block should measure 23" square; the smaller block should measure 11-3/4" square.